This Electronics project work on RFID shopping checkout system will help in eliminating long queues for bill payment of your shopping. By using this prototype RFID checkout system, customer will able to pay the full bill upon their arrival at bill counter which will increase the customer satisfaction and will effect in reducing retailer costs, and ultimately lowering consumer prices. At present radio frequency identification (RFID) tags are used widely in everyday authentication systems and holds great promise in the retail world for both customers and stores in inventory control, convenience, and cost savings. 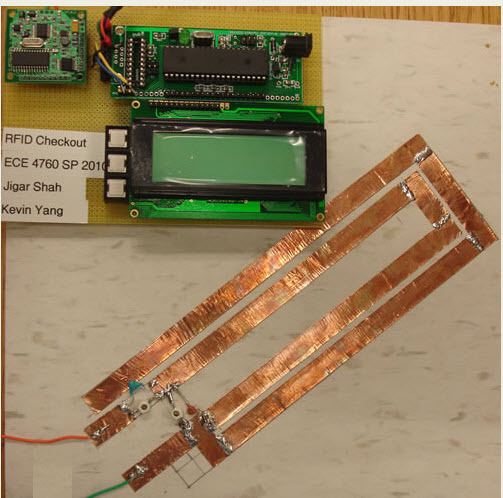 This project utilized these RFID tags to automate the shopping checkout process as discussed above. This will be done, by building a system that could read the RFID signals of all the objects that were placed in proximity to an antenna platform and this will eliminate the need of barcode in scanning of each individual item which will make checkout a faster experience. This report includes all the information and component list which will help you in making your project along with controller programming.